Heat avocado oil in a sauce pan on medium heat. Add diced onion, and sauté until translucent. Add garlic, celery, and sweet potato, cook for 1-2 minutes. Add bay leaf and spices, stirring continuously for 2-3 minutes. Add lentils and water, bring to a boil, then lower heat to a gentle simmer. Add salt and pepper, and let cook for 15-20 minutes, stirring occasionally. Lentils should be soft and mushy, remove from heat when ready. Add chopped parsley and currants, and season if necessary. Garnish with hemp seed. 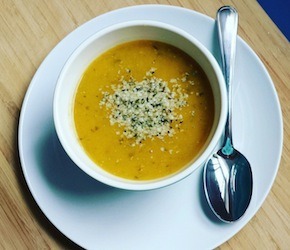 Read Alex’s blog post Eat This Soup If: You are Active!